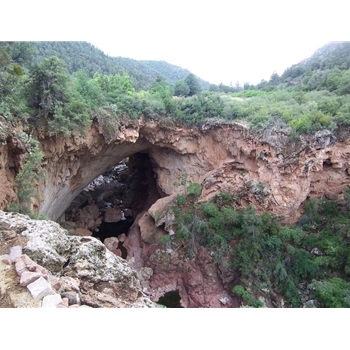 Tonto Natural Bridge is located in central Arizona near Payson. It is the largest natural Travertine bridge in the world. The bridge stands over 183 feet high, 150 feed wide, over a 400-foot long tunnel. There are three hiking trails, picnic areas and a group use area. Features and Interests: Largest travertine bridge in the world, interesting Geology in the region. If you enjoy hiking a creek, you can hike the creek up-stream and down-stream of the bridge, very pleasant and fun! Trail Description Upon entering the park you will find a number of large picnic places and plenty of parking. This place is great for families looking to spend the whole day relaxing, picnicing, some hiking and enjoying the beautiful nature. - Bridge Trail - a route down the cliffs just below the bridge. This is quite steep and rather slippery in places but well worth the trip as it leads directly beneath, and in times of low water it is possible to walk through and link with the end of the River Trail. High above, a small waterfall cascades over the edge of the bridge with more trailing grasses and ferns. - Waterfall Trail - a very short path down into the canyon above the bridge to a grotto with hanging greenery, seeping water and travertine formations. - River Trail - a longer path alongside the west side of the creek to a viewpoint beneath the bridge, a good place to appreciate the stalagtite-like formations that hang from beneath the bridge and adorn the west-facing canyon wall - aptly described as an 'outdoor cave' by the park brochure. This trail has recently been extended to link with another path above.